An elegant garden, stuffed full of specialty stitches that are as lovely as all the herbs growing here! 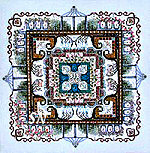 Martina Weber's newest design, this finishes approx 11 x 11 on 32ct. 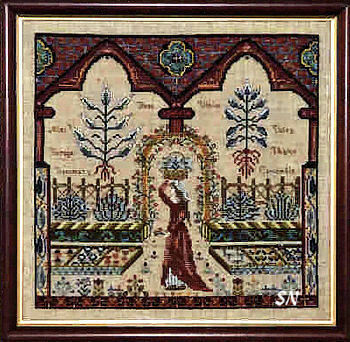 The chart is beautifully presented, and as this is not as large as some of her other pieces, it isn't nearly as intimidating to the not-so-patient-stitcher -- like ME! Very European in feel, very pretty! Offered as the chart. 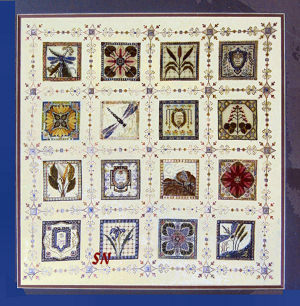 Martina Weber of Chatelaine brings us this lovely piece... a medley of 16 individual 3-1/2 inch designs... surrounded by lacy borders... to present a stunning 22 x 22 glimpse into the colorful world of the tiny pond that could be in your back yard! 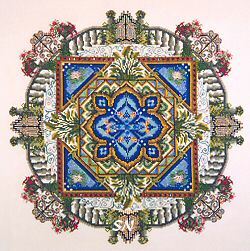 Absolutely breathtaking in color and detail, you can stitch each block by itself, choose 3 or 4, do the borders... just any combination of what is presented in the design. Dragonflies and lily pads, some of the designs are kaleidoscopes of the colors of nature. This is just lovely!!! 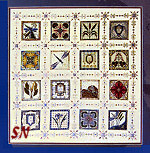 Offered as the charts, **16 of them,** plus the border! 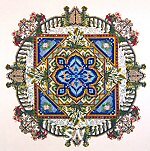 The latest in Martina Weber's Mandala Garden set of designs... like all the rest... this is intricate and absolutely breathtaking!!! Our shop model is half-finished. It may never get all the way completed, but it's a show-stopper just like it is! Offered as the chart (12 pages worth! 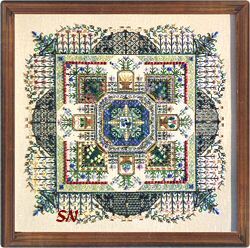 ), it finishes approx 17 x 17 on 32ct. Stitched in quite an assortment of hard-to-gather-together threads... this kaleidoscope design is not actually the same on all four sides... although it teases your eye into believing that. Martina suggests you label the top of your piece somehow -- sew on a button or something -- because it's really easy to get turned around during stitching. Luscious colors and wonderful garden details... as I look at the chart on my desk, while writing my description for you... I've discovered that there are initials and a date in the very center... and they glued on their photo upside down!!! So, bask in the lovely colors and intricate design... and keep track of the top! 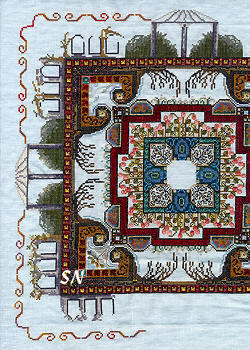 The Mandala Gardens are a challenge to stitch and a feast for the eyes! 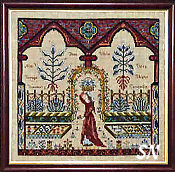 Beautifully charted, these contain special stitches, along with bead and crystal embellishing touches, and are worked with DMCs and Silk 'n Colors, with touches of Kreinik metallics. No words from me can describe the visual impact, the intricate details, the symmetry, rich colors and elegance of these... they are truly works of art! And... sure... you have time to stitch a few more family heirlooms!!! Each garden, finishing approx 17 to 19-ish inches square on 28ct linen, is available as a chartpack, with pages and pages of charts! Exquisite!! !